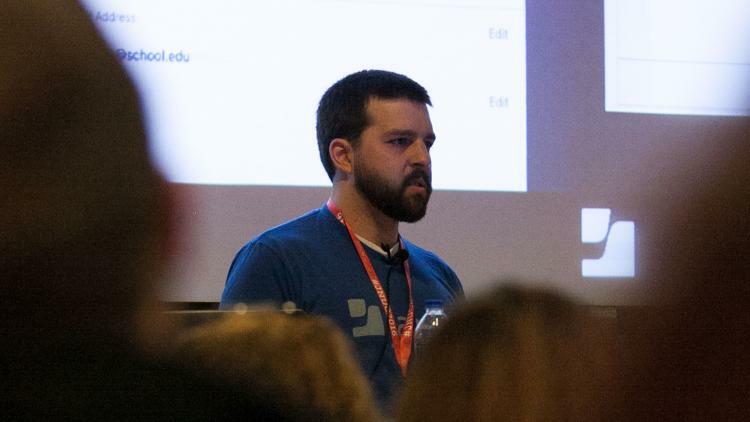 Watch these JNUC sessions in their entirety: Part I and Part II. In Apple School Manager 1 Mike Levenick, Technical Support Specialist, Bryan Hengels, Senior Software Engineer and Adam Schreiner, Senior Software Engineer discussed how the JSS syncs data from Apple School Manager and how you can set up your users correctly. In this session, the team dug into details of how to configure those users with classrooms. They also provided a deep-dive on how administrators can use the JSS to configure iOS devices and how profiles manage which iOS users are configured with specific apps and layouts. The three main topics focused on in the session centered around roster to JSS data, the sync process and student photos. JSS data - The team discussed the integration with JSS to bring classes, teachers and students information in from Apple School Manager. Sync process - Eventually the data that you have about students, teachers and classes will change. The team reviewed how you can select the date and time to ask Apple School Manger to update class and student inventory information or choose not to sync. Student photos - The team discussed student photos, which allow students to select a picture of themselves instead of just their initials for ease of logging into the iPad. Some things to keep in mind around the configuration of this feature include security, linking users in the JSS, where the data goes and distribution point. This session focused on the new education profile used to initiate and maintain the elements for Apple’s Classroom app. In addition, Bryan Hengels and Adam Schreiner discussed the new home screen configurations options available for iPad management. In addition to basic user, class, device serial number and teacher alignment, the educational profile enables passcode type configuration. Passcodes can be configured to be simple numeric combinations of four or six digits, or a complex combination. For the shared use, there is an option to select multiple users. In this scenario, data remains cached on the devices. Data can be stored for up to 10 users. Once the set number of users has been reached on a shared iPad, the data is removed for the student who logged in longest ago. From Jamf Pro, users can be cleared from a device, if necessary. After the initial setup, both student and teacher devices are kept up to date through syncing. The workflow for these changes begins with the Jamf Pro admin. The admin edits the user, devices, or class information in Jamf Pro, and the profile is removed and installed to the appropriate iPad. Managed Apple IDs enable shared login and associate student images with users. The result is improved ease of use and a level of personalization normally found in 1:1 iPad programs. An image URL associates the pictures, private key and certificate to connect the photos to the Managed Apple ID. With app usage configurations, schools have the ability to install multiple apps on an iPad, without making them visible to all users. Specific apps can be arranged according to specific classes. Further, through the home screen layout feature, schools can configure the apps in a specific order.